You might recall that years ago I blogged in a different little corner of the internet. As I mentioned in the other post, What’s Cooking in the Orange Kitchen was truly the bug that bit me when it comes to not only blogging, but also exploring the world of the cooking and baking. Looking back it can be easy to criticize myself for the photos, writing, and recipes that I shared, but I try not to be too hard on myself because it is a nice reminder of both where I came from and how far I’ve come. And truth be told, it wasn’t all so bad. I pulled over 31 of my favorite recipes/posts a while ago, but there are still some gems over there that I hope to bring over to the Sunny Side with updated recipes and photos. 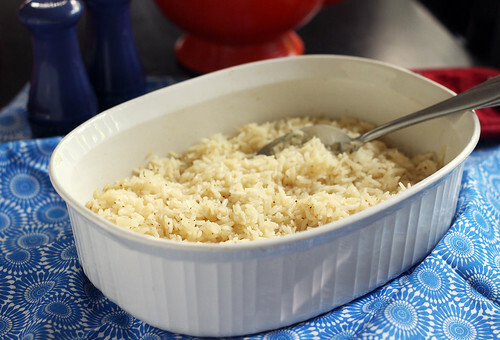 This Baked Garlic Rice Pilaf is one of those gems. From the first time I made this recipe we were in love. 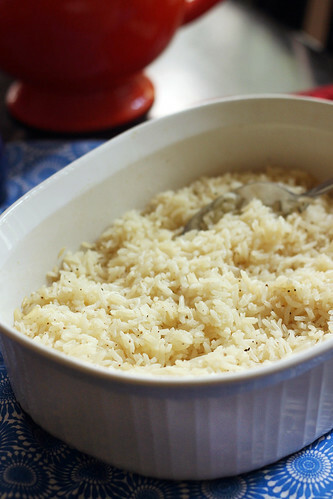 The rice is infused with garlic flavor and comes out light and fluffy. The squeeze of lemon I added the first time I made this also adds a nice freshness. You can serve it with fish, chicken, pork… Truly a fantastic versatile side dish. It might seem time consuming, and it does take while to bake, but most of the time is hands off, so you’re free to work on a main dish or even just relax! I promise it will be worth the wait! Melt butter in a large skillet over medium-high heat. Add the crushed garlic and rice and cook for about 2 minutes, or until the rice and garlic start to turn golden brown. Add 1 cup of chicken broth and bring to a boil. Transfer the rice and broth to a casserole dish with a tight fitting lid (or you can use two sheets of foil to seal the dish). Place in the oven and bake for 25 minutes. After 25 minutes, remove the casserole dish from the oven and stir in the rest of the chicken broth (1 1/2 cups). Re-cover the dish and continue baking for 45 minutes. About 15 minutes before the end of the baking time, remove from the oven and squeeze the juice from half of a lemon over the rice. Re-cover and finish baking.